Tobias Herz is the eldest known ascendant and the one who made Tobias the civil family name for his descendants. He was born around 1758 and made his living – as most of the country jews of that time – as a cattledealer. He married Täubchen Samuel from Urbach in the Westerwald. Their children were born in Oberdreis near Puderbach. In the 1811 Jewish census of the territory of Nassau, the family of Tobias Herz and Täubchen Samuel, appeared residing in Oberdreis: Tobias was 52 years old, his wife 36. Her name, meaning “dove,” was spelled “Däubgen” in this census list. At the time they had six children: The eldest son Herz was 13 years old, Eisik (must be Michael/Schmuel) was nine, Jacob eight, daughter Hendel was four years old, Schmuel (must be Isaak/Eisik) was three and David one year old. Tobias Herz had been “Im Schutz” (under protection) for 16 years, paid 13 Florin protection tax per year, two Florin community tax and was equipped with 600 Florin assets. Elder people from Oberdreis remember narrations that the Tobias family once came from the Rhine. Perhaps Tobias Herz originated from Bendorf-Sayn, a town located at the Rhine between Neuwied and Koblenz. Several men named Herz who used to live there might have been his brothers or cousins. 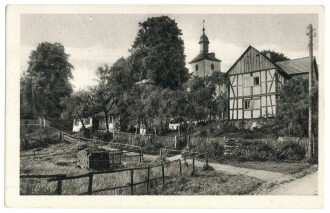 Tobias Herz resided in Oberdreis since 1795. His wife came from the village of Urbach, which belonged to the community of Dierdorf. In the 1811 census there was only one other family registered in Oberdreis. They went for religious service in Puderbach and burried their dead at the cemetery in Dierdorf. Napoleon left his cultural marks in the Rhineland since the beginning of the 19. century and so in 1846 also on the right side of the Rhine a civil registration was installed, which recorded all citizens – Christians as well as Jews. The eldest son of Tobias Herz was called Herz Tobias according to the usual practice. But also the other children probably were given the second name Tobias by their parents right from the start. So in 1846 it finally became official what the father was not meant to witness anymore: Tobias (Tuvijah = god is gracious) became the heritable family name. Tobias Herz died in 1833. Probably he was burried in the old jewish cemetery of Dierdorf which doesn’t exist anymore. David died at the age of 18, but the other five siblings got numerous children and grandchildren. Some stayed in Puderbach and the surrounding villages, some moved to the cities and established a completely new existence their ascendants once were denied. Many of these children were not meant to survive the Shoa, some managed to emigrate to America or England, few are living in Germany today. It’s possible that Tobias Marx from Anhausen had been a cousin of Tobias Herz. His son Jacob Tobias also took the family name of Tobias in 1846. Unfortunately there are no documents left from the time before 1828 which could prove a kinship.